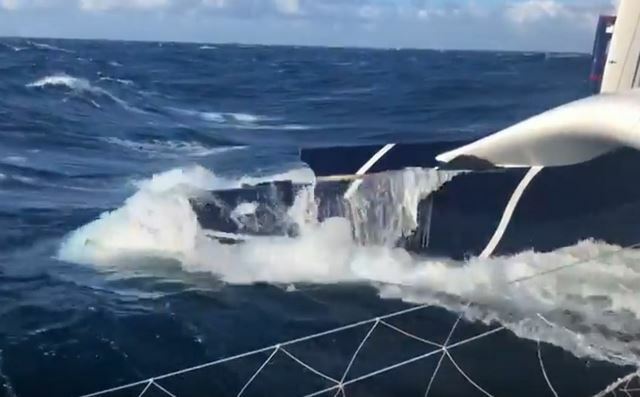 While he was about 100 miles from Cape Finisterre and was advancing at an average speed of 30 knots in strong winds and 4 meters of swell, the Sodebo Ultim 'skipper dropped a reef in the mainsail. It was around 10:15 this morning and the boat was moving to reaching (crosswind) starboard tack. Thomas Coville then saw a crack in the port forward arm and realized that the arm fairing was damaged. He immediately informed his technical team. At the same time, the technical team is on its way to welcome the skipper and the boat. 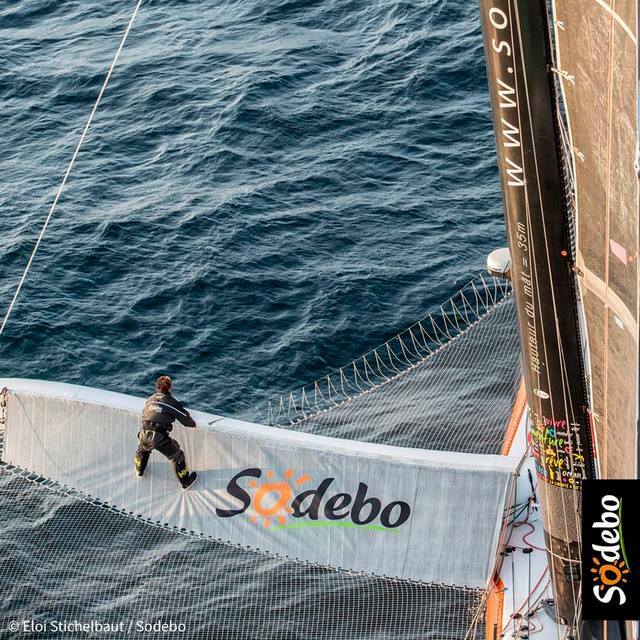 From the Lorient routing house, Jean-Luc Nélias (Sodebo Ultim 's router) is in contact with Iker Martinez (Spanish offshore rider) to coordinate logistical and technical support on the spot. With Alex Thomson leading the way and Jérémie Beyou suffering from some worrying steering damage, Marc Guillemot offers us his look as a specialist and gives us his personal analysis of the first day of the Route du Rhum-Destination Guadeloupe in the IMOCA class. "The sailors are experiencing a rough start to the race. It's not easy for anyone. They have been kept busy for the last ten days in Saint-Malo. Even if from time to time, they manage to get away from all that, tiredness takes its toll and some were not at 100% of their capacity when they set sail. That can cost them dearly at the start of the race, seeing there are complicated weather conditions. Since yesterday, I have been closely following Alex Thomson's trajectory. He was the only one to go to the north of the traffic separation scheme off Ushant. Other skippers may well have considered that option. They needed to take a decision once they had reached Bréhat. Aiming for the north of the TSS involved hoisting the spinnaker instead of the gennaker, and forcing them to carry out extra manoeuvres. With the worry of having to bring down the sail quickly if the wind got up and the danger of finding themselves entering the TSS... I put myself in the position of Alex's rivals. We are sailing well. We can luff up with the sail we have and instead of heading to the north of the TSS, we're tempted to go south. I cannot judge their choices, as it is far too easy to do that from ashore with your feet up. Everyone follows their route depending on how they are feeling, how the boat is and how well prepared they are. In any case, Alex pulled off a good strategic stroke. He took a risk by moving away from the direct route, went on the attack and kept going all the way. Today, he is reaping the benefits of his investment. Hugo Boss was the first to pass to the north of the current low-pressure system, and in particular, he is well placed to deal with the next. Before the day is out, he'll pick up a SW'ly wind and shift to the port tack, which will mean that he is ahead of the big low. He will be able to make headway southwards and westwards and in his choice of route will have more freedom than his rivals, who are sailing further east. If he needs to come around slightly in the heavy weather, he will have plenty of room without having to worry about getting too close to the coast of Spain. To sum up, the further east you are, the less favourable the position to deal with the low. As a sailor stuck in front of my computer screen, I'm watching this Route du Rhum with a great deal of interest. I'm watching in particular the close fight that is going between Vincent Riou and Paul Meilhat for second place. I can see too that Alan Roura has had a fantastic start to his race. It's nice to see that the older boats with some determined and hard-working sailors can keep up with the best in these tough conditions. "Fighting against mountains of water"
Conditions are tougher for the leaders, starting with Alex Thomson. Sailing at twenty knots in such heavy seas is no easy matter. I can imagine that Hugo Boss is under the water with Alex inside in his foulies, ready to leap outside if necessary. Given the conditions, he is probably sailing with two reefs in the mainsail and the J3 headsail. Sailing like this requires you to keep cool and remain focused. In the coming hours, conditions will be getting more complicated for everyone. Until they cross the line from the Azores-Lisbon, the sailors will be at war fighting against mountains of water. They are going to have to do their best with the boat and look after themselves, putting the rankings to one side until the race can get going again. The important thing here is getting out of the area of low pressure with a boat that can still perform well. It's going to be hard, but they need to hold on in there. In the IMOCA class, we're looking at professionals, who know how to deal with these conditions. 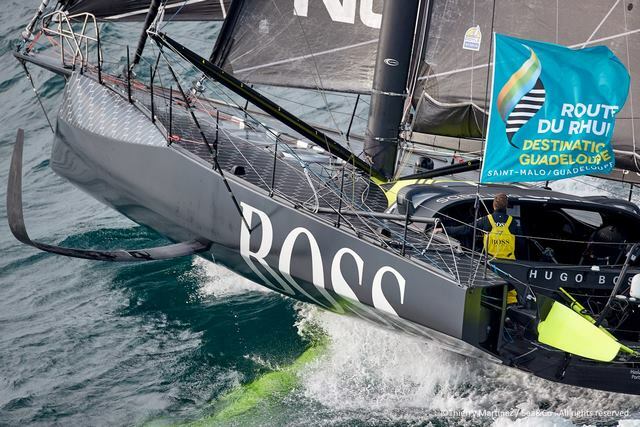 But they nevertheless need to pay attention..."
Shortly after 4:30 GMT, Sébastien Josse alerted his team manager to major damage aboard the Maxi Edmond de Rothschild. 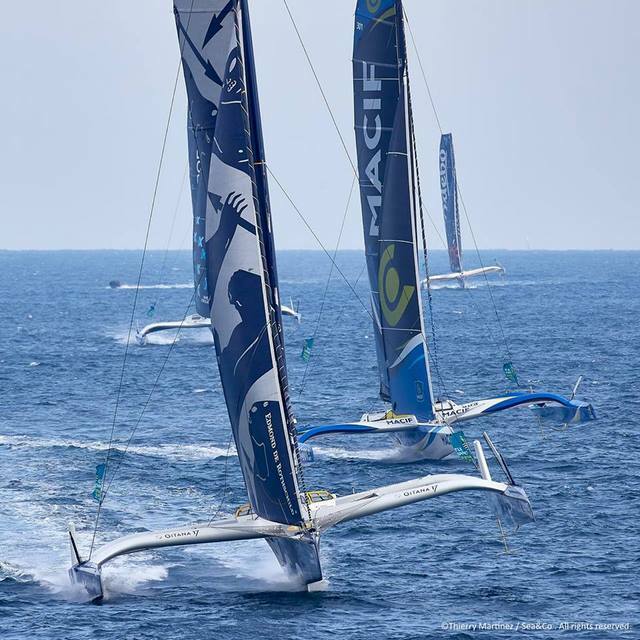 Leading the Route du Rhum Destination Guadeloupe fleet after an outstanding start to the race, the solo sailor came to a violent halt. Immediately up on deck, he observed that he'd lost part of the bow of his starboard float. It is night time in the area and given the sea state nearly 4.5 metres of swell and wind - 30 knots of northerly -, it's difficult to gauge the extent of the damage for now. Sébastien Josse is safe and sound and together with his shore team and his routing cell he's currently looking for a solution to make terra firma as quickly as possible. Indeed, the most important thing right now is to get the sailor to shelter as a new low pressure system will sweep across the Bay of Biscay over the coming hours.